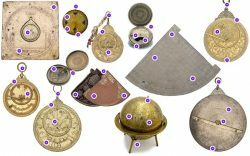 Curate invites adults and young people to share ideas, thoughts and reflections and help shape the Museum's display of its amazing collection of early scientific instruments from the Islamic world. The project includes two co-curation workshops at the Museum – one on Saturday 25 November, 2017, and the other on Saturday 2 December, 2017. The workshop will consist of various activities which we hope will be fun and informative focussing on our collection of early scientific instruments from the Islamic world. The activities will include supported opportunities to learn more about some of the types of objects on display through object handling as well as opportunities to post your comments and feedback on the current display. Later in the workshop we will encourage groups to create their own cut and paste display of a selection of objects annotating possible ideas for themes and interpretation. To get the most out of the activities we recommend that any children involved be over 10 years old. Children must be accompanied by an adult. Participants will also be invited to a follow-up event in early December to share ideas from both workshops and discuss how some of them may be included over the following months.